One was already a co-owner of Felipe and Sons Barberdashery, another a foodie, and another partner was into operations. One idea led to another, and the three decided on a unique food and beverage concept: Thirsty Barber was born. 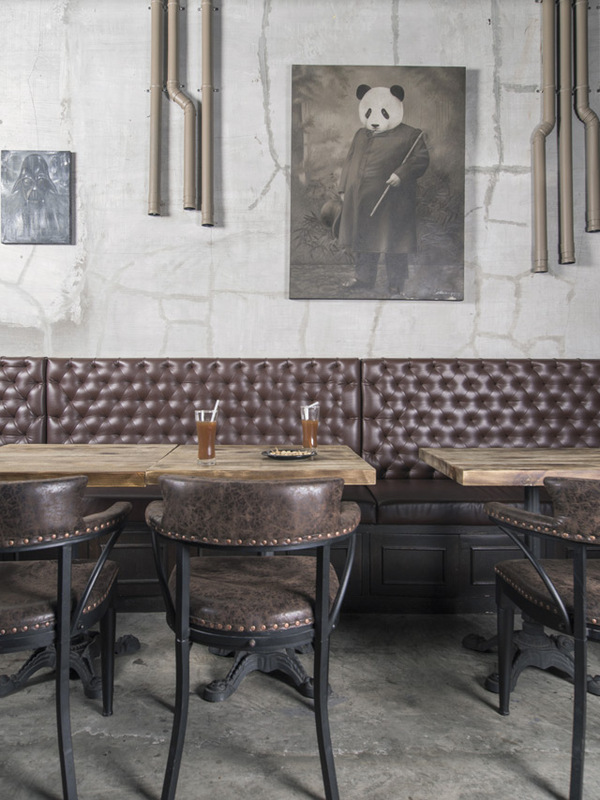 What inspired it was the Blind Barber in New York, a modern pub hidden behind a barbershop. At that time, Felipe and Sons was on a quest to conquer the San Juan area, so the timing was right. 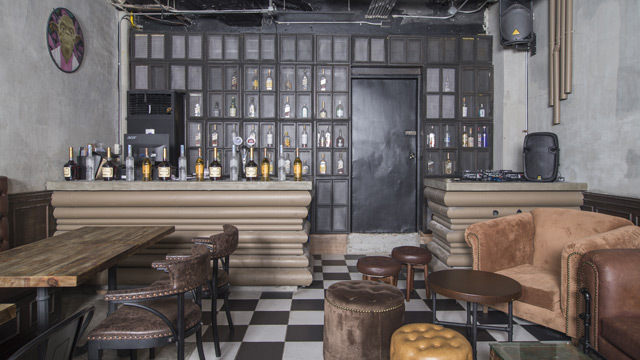 “The concept of a speakeasy bar is something new to the Philippine market, the good old clients of Felipe and Sons, and for the San Juan residents especially,” says Jonas Tamayo, who handles marketing for Thirsty Barber. So you walk into Felipe and Sons and see the usual: barber chairs, mirrors, and bookshelves all around. There is a vintage feel to the space, as if you are entering your grandfather’s study—one that has a couple of trick bookcases that actually lead into Thirsty Barber. 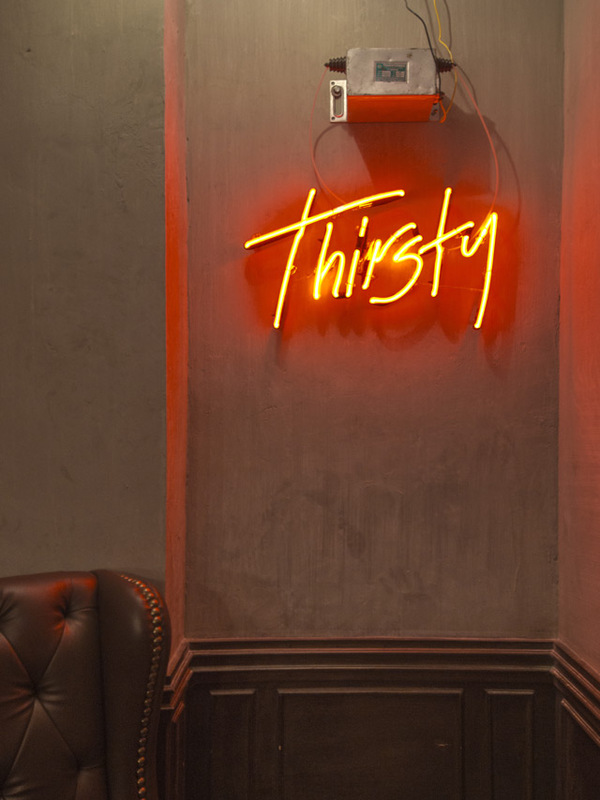 A lighted sign behind one door says “Thirsty,” leading you to a small lounge by the restrooms. 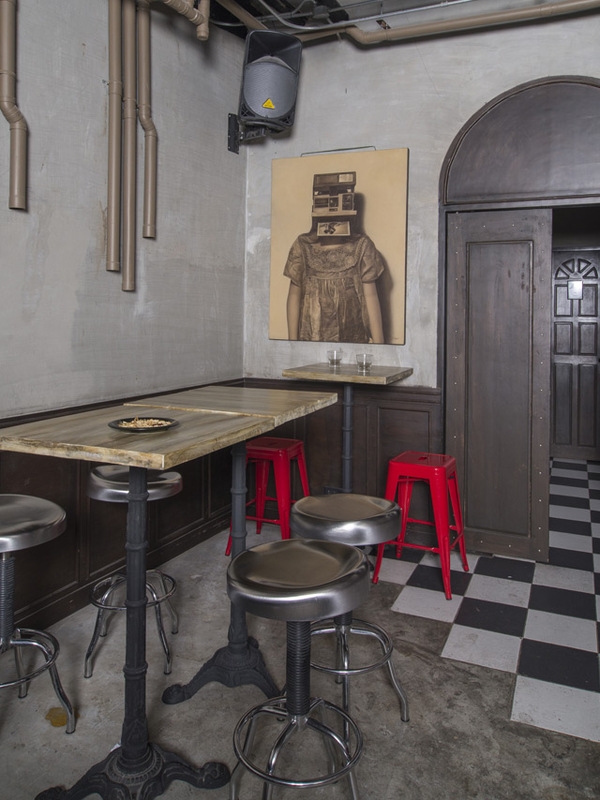 Take the other door, and you will be greeted by an industrial-themed pub that mirrors the vintage feel of the barbershop. The checkerboard floor tiles set the stage for the tufted couches lined up against one side of the bare concrete walls, the exposed pipes in the ceiling, and the oil on canvas paintings. RL Tip: Achieve the industrial New York vibe by opting for a palette of moody tones like dark browns, grays, or aegan blue. Tufted chairs in luxurious fabrics like velvet and leather add a touch of elegance. Work on a balanced final look by bringing in small accessories in vibrant hues. 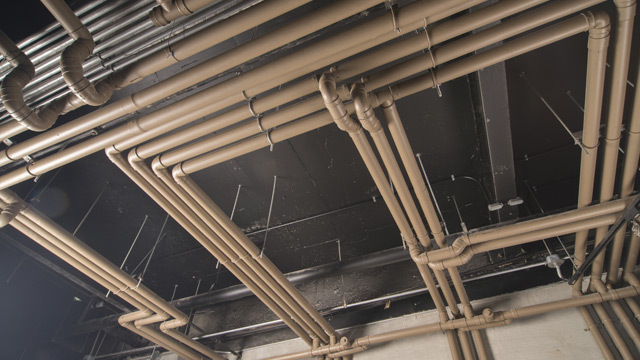 “We maximize the exposed pipes. Some of them are decorative, and others are real, so at some point during the day, they make a sound when someone uses water upstairs. It’s part of the whole experience,” describes Jonas. Every piece of artwork is on sale, too, turning the bar into a gallery of sorts. These are all by Filipino artists: Martin Matuan, Clai Litiaco, Fernando Antimano, and Sydney Valdez. Some of the pieces are commissioned paintings for one of the owners. As for the other accessories, Jonas says the owners wanted it to be “more organic,” in such a way that they donated some of their personal items for display. “There’s a part of them that’s in here—an old globe, books, toys, trophies. Vintage talaga. Pretty old school,” adds Jonas. Store hours for the barbershop and the bar overlap, as the idea is to “get groomed and get thirsty.” “We try to sell the experience. 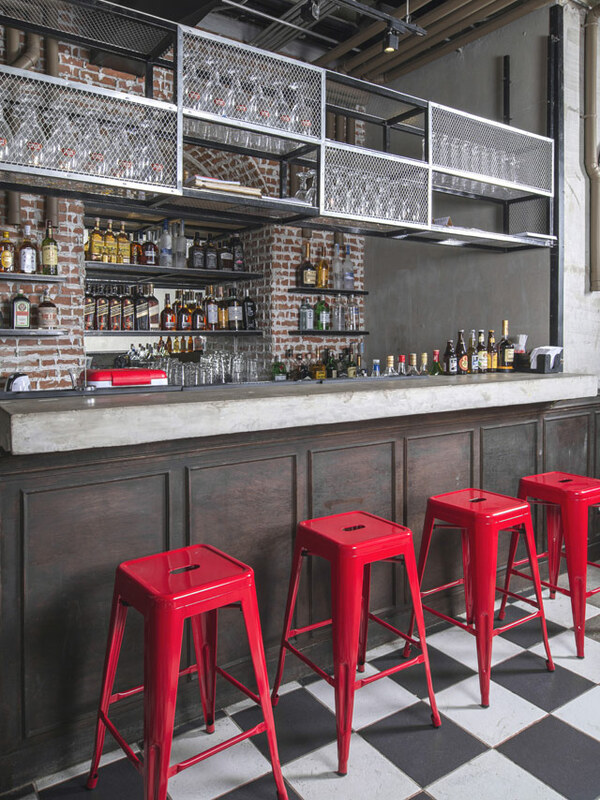 You would have people who grew up in San Juan, but when they discover Thirsty Bar, they’re surprised to find something like this here. May exclusivity because it’s a speakeasy bar,” Jonas says. Visit The Thirsty Barber at G/L Promenade Building, Wilson St., San Juan City. The pub is open Sundays to Wednesdays, 6pm to 2am; Thursdays to Saturdays, 6pm to 3am. This article originally appeared in the June 2017 issue of Real Living Magazine. Minor edits have been made by the realliving.com.ph editors.